Normally, the very first tough grammar point I touch with my students is the Italian present tense. It’s one of the very first complex grammar rules I have to teach. You might have had doubts about it as well, and I cannot blame you. The first time you see a verb table with a conjugation in it, it can be quite scary. So, I decided to break down the Italian present tense into three parts. 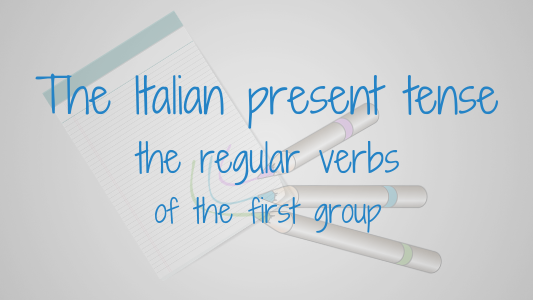 So, in this video we’re going to have a look at the verbs of the primo gruppo. You will find a video and, as usual, a game to help you practice these verbs. You are so good as always. But the “Let´s play” does not work for me. It´s not starting. Maybe it is just a temporary fail. Grazie, Mia! It’s so nice of you. I’m sorry to hear that it doesn’t work. Fantastico Lesson Gloria! Molto Grazie !